JumboFox is dedicated to the provision of high quality, easy to use digital content while protecting the intellectual property rights of the content creator. JumboFox provides content services to a worldwide market of Education and corporate users with 27 languages supported. JumboFox is an ecosystem for publishing, distributing, managing, and even consuming digital resources: books, music, movies, images, applications … anything digital. The base functionality of JumboFox includes solutions for publishing, discovery, evaluation, deployment to groups, consumption, expiry, and multi-tier ecommerce. That means JumboFox can be a locally resident apps store on a PC … and can be used to acquire, manage, and deploy content to groups (such as students or teachers in a school). 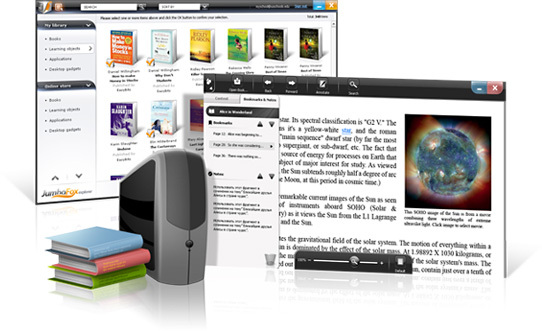 JumboFox includes an eReader for PC users, which can be used to view digital content such as books, animation, or audio. Individual JumboFox users see and access all their content via the JumboFox library. Here, they can also browse digital stores and libraries that they are authorized to access. We are working with a number of different companies on digital publishing solutions for the educational market. If you’d like to partner with us in bringing a solution to market in this space (app stores, digital publishing, digital distribution, and so on), we’d love to hear from you.